From Goodreads.com When Adele Scott found an advertisement for a bride she had no idea how much her life would change. When she finds herself married by proxy to a man she has never met she feels conflicted. Things get worse when she travels to Texas and finds that her new husband is old enough to be her father. Peter Davidson has a secret and he is unwilling to see his life continue the way it had for so many years. When he posts and ad for a wife he had no idea how many women would reply. When he read a letter from Adele Scott he knew that she was the one who would make his life anew. Peter has a surprise in store for them. I have to admit, from the title and synopsis of this book, it was totally not what I was expecting (and I mean that in a very good way). Life, Love and Second Chances is a relatively short read (I finished it in just a couple of hours), but the author did an excellent job of constructing her story-line in a way that it all fit together and was smooth flowing. I found myself lost within the world that she created, wondering about the characters and their motives. As hinted at in the synopsis, the Davidson family do have skeletons in their closets, but they are revealed before the end of the book (with one twist that I did not see coming). The characters are developed in the sense that each acts and reacts in a way that I would completely expect (even if with some of them the driving factors behind their actions is not immediately known). 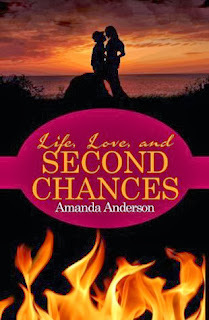 Life, Love and Second Chances is not without its own errors, I did find a couple instances where words were misspelled, or not used properly, but over all this happened so rarely that it was easy to overlook. I also would like to say that I wish there had been more of a back-story for the characters. I would have liked maybe a prologue where you learn more about the letters exchanged between Adele and Peter, and more about what would cause a young woman to marry someone she had never met and knew nothing about. But again, these were minor details that could be overlooked on the whole as this was a truly enjoyable read. Overall, I would definitely recommend this novel to those of us looking for a quick and enjoyable read.